IBM undertook a ‘galactic’ intranet redesign a few years ago. In fact, it was a departure for Big Blue to undertake a new design that was very ‘Apple’ – very white and grey. However, the design wasn’t a huge hit with employees, and user satisfaction was lower than hoped. Employee surveys on the IBM intranet home page, called W3, found that satisfaction levels were dropping far too low for the intranet team’s liking: overall satisfaction had dipped to 67%, which meant in some geographies outside of the U.S. it was below 50%. Slow load times were also a frequent complaint of the 400,000 approximate users. 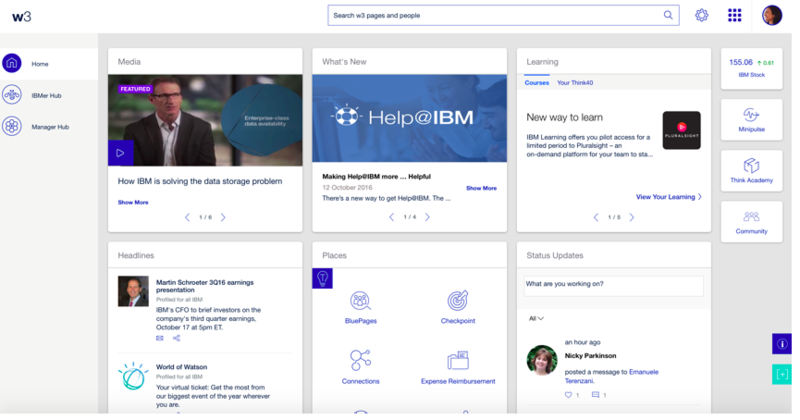 IBM took notice, undertook scads of additional user research, and rolled-out a bold, new, innovative design this past fall. Denoted as Project Butterfly – a broader initiative of which the intranet home page was one component, but also extended to a manager’s intranet hub, mobile apps for employees, etc. The redesign goal: make employees happier and more productive. In other words, IBM took employee feedback to heart and really dove deep into the research to find out what employees really wanted. The research also uncovered a finding that most take for granted – employees were mostly using the intranet to search (either the search engine, or the employee directory). Social engagement – collaboration (social media) should not be a destination – engage with whom you need, when you need them. Great intranets begin with people – in fact, great intranets are obsessed with the people they serve. Technology is just an enabler. The real key to a successful intranet is people, and the process required to support not only managers, and executives, but the end user. The dedication, rigor and resources required to build and maintain a great intranet or portal are significant. And while a successful intranet does not necessarily require a lot of money per se, there are many, many facets that require attention, especially successful planning and governance.